The Internet is visual. Yea, we know, you already knew this. But where do you find all your beautiful content? No matter what business you are in, I bet you are scouring the Internet much like I do to find that gold mind of free, royalty free photos and graphics. Well, luckily for you I’ve spent years looking. And I’ve discovered some pretty incredible finds. But you’ll want to know this first. Do you know that the subconscious mind interprets and processes symbols and images significantly faster than text or any other format? Do you know how vital beautiful imagery is to your success as an entrepreneur? Well, you will by the time you’re finished reading this article. We love running targeted advertisements on Facebook. I know, you’re like…where are you going with this? Trust me it’s vital and makes so much sense. We have sent dozens of Facebook ads out on behalf of dozens of clients, all with varying targeted audiences and products. Some of those ads flopped. I mean they did absolutely nothing. It was a little disheartening. An that’s a bummer. Especially for us being marketers. Though they say, that with every failure there is a little gold nugget of success. With that, we made some tweaks and small changes that made all the difference. But I have to warn you, this may not work for everyone. You really do have to have a great product or service backing this ad. Something amazing that people will want to be a part of. Otherwise, I hate to say it, but you’re setting up for a miserable failure. So, we made some changes—we switched up the photos. And we weren’t sure how they were going to perform. Well, let me say that the changes…. Made our jaws drop. The advertising results for the same businesses (as earlier) went from complete failures to wild successes! We’re talking like a 80%+ conversion of clicks. Exciting right!? Just imagine. Your email marketing campaigns flooding with hundreds of emails every week! Sound like a dream? You should know by now, that your email list converts to dollars in your pocket. Let me ask you— do you follow brands that you love? Perhaps you open every email they send through, or jump at the opportunity to interact with them? This is usually how it goes with powerful brands. Those like Starbucks, Apple or Nike. The point here is that they’ve earned your attention over time. They’ve gained your respect. They did this through creating remarkable customer experiences. Those things that really make you remember that brand and that experience. They added value to your life. And we we reward these brands with our attention. This is something that every business needs to replicate in their marketing to earn customer attention. Even with incredible value— we are in a society of fleeting attention. We must get the attention of our audience and wow them all at the same time! And it must be earned. Some feat huh? Well, I’m telling you… It can happen. And it did happen when we made this one change in our ads. I know you’re waiting for it. Are you ready? This one thing will increase your conversions substantially and garner the attention you want so badly from your audience! But remember, we did say that you have to have a product worth that attention to begin with. Otherwise start praying, because if you don’t have something worth talking about—well, you don’t have anything. We told a story through beautiful engaging photographs. Photos and images that allowed our viewers to place themselves into the picture. To daydream. To think about what it would be like to be a part of this brand, this movement or this offer. Don’t think logically here. It’s all about emotion. Dig through all the photos you can find—whether yours or as a stock collection. And find those engaging photos. You know the ones that stop you. They make you think and start daydreaming. They invoke curiosity. They inspire. What if I told you, that you didn’t have to spend hundreds or thousands of dollars on these little works of brand inspired art? What if I told you that from all my years of design, branding and advertising that I have a stock of photos and resources. What if I told you that almost all of them are free. Yea. I did say that. For frizzeee! I bet you’d be pretty excited! We all like to make things easier, and make more friends and more money at the same time. And, much awaited, here they are! These guys are one of my favorites. They are hobbyist photographers that travel the country and take beautiful photos. They’re for pretty much any use—commercial, advertising, editorial. They just kindly ask that you don’t claim their work as your own. Pretty good bargain, huh? They conveniently send you an email every month with a bunch of photos. And, if you want the full archives of the last year or so… it’s just $10/month to access them. Hundreds of photos for $10, at your fingertips. Otherwise wait for the freebies that show up in your inbox. People post thousands of photos onto Flickr everyday. Just hop onto the site and do a quick search for “creative commons.” Or choose to do an advanced search and plug in your desired topic or keyword and select that you’d only like to search in the creative commons. Just make sure you read what license is available before you snag the photos. There’s totally some beautiful finds here! Stockvault has loads and loads of royalty free photos. And there’s quite a variety! There are a descent amount of professional photos, and probably equally as much from hobbyists or amateurs. Subscribe to their newsletter and they’ll send a pack of photo textures to you along with new popular finds. Foodie’s Feed is just what it sounds like. A feed of original, (mostly) free photographs of food. Probably mostly for foodies. They’re just beautiful photos of food. Some are closeups, some bird’s eye view, and some have great wood or slate textures behind them. They add 5 new photos every week… and again, the theme here is that many of the choices are free. Go premium and pick up huge sets of photos for something like $3-$15. Another bonus? You can download them from dropbox in their raw file versions. Go make some food photo art! PicJumbo is totally full of free photos for commercial and advertising use… or whatever you want—use. There are loads of abstract bokeh photos and textures. They have a bunch of categories to choose from and search within. And, if you want the full kit and caboodle their premium version is $6/month. New Old Stock is full of totally vintage photographs from the public archives. Totally free and you can use them for absolutely anything. Browse the site and find that nostalgic part of yourself that longs for some black and white! And, I just had to post this photo… I couldn’t help it! 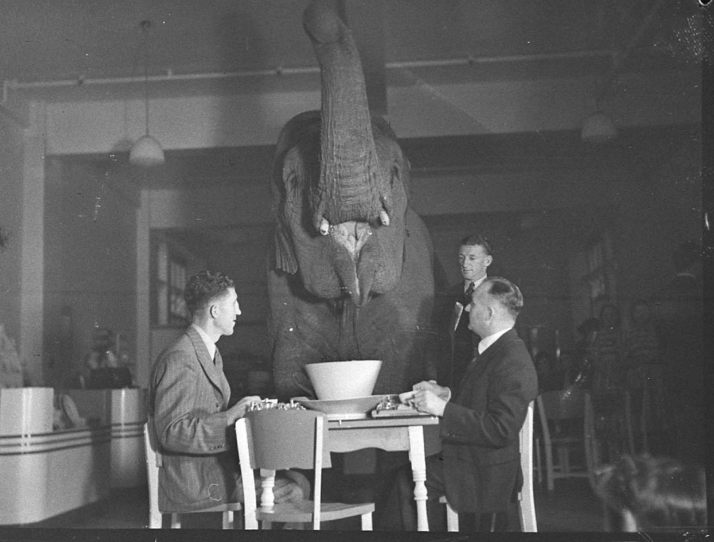 Who wouldn’t want an elephant to join them at tea!? These guys have sooooo many patterns! As I expect you would gather from the name. Yep, tons of repeating patterns, and they’re fun and easy to peruse and download. IMCreator is actually a website builder. But, they also happen to have lots of free photos, and they’re so incredibly easy to browse. They have lifestyle photos, to transportation and even some fashion themed. Enjoy! Magdeline has tons of beautiful photos of the outdoors for more adventure or exploring imagery. It’s super easy to browse through and to explore their categories and stock photography. And of course, download them all for free! Little Visuals consists of many high-contrast nature and landscape photography. They also have loads of close-ups, and abstract imagery. Scroll to browse, and download at your leisure! Expect to find a plethora of aerial imagery. Most of the photos have a vintage flair, and there are many textures, and abstract nature. Most of the photos are nature based, and some beautiful topographic photos. Shutterstock has such a vast array of photography (and vector images and graphics!) that you could probably spend your entire life reviewing… no joke. There’s so much! They only give away 2 free images every week. Check in weekly to download the gold. Otherwise this is a fully paid platform. And they have a variety of packages. Seriously, they have everything. It’s worth having them on your list, even for some green. Enjoy the photo gold! And use them well. I’m happy to pass them along to you. We just recently launched pre-sales for our new Branding Course! Dig it? Swing on over,here>. Which resources do you like the best?